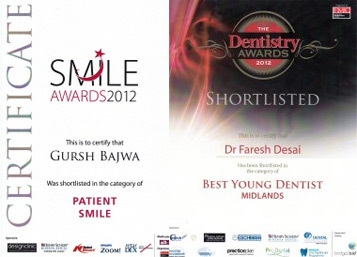 At our practice we are dedicated to delivering the highest quality treatments and patient care to our patients. Not only is getting the very best result a main priority, but also ensuring that before, during and after treatment, the patient is very well looked after and they are comfortable and relaxed. When treating patients and meeting new patients (especially nervous patients) we find that going slowly and carefully explaining procedures to patients helps them to relax more and enjoy their chosen treatment. We understand that making a decision to see the dentist can be a big step for some people and they may need extra time to attend their appointment. For patients who do require an extra bit of help to complete their treatment, we do offer IV sedation. When we need to administer the anaesthetic to numb an area of the mouth, our dentists have undergone modern dentistry techniques which allows them to deliver the injection without virtually any pain. We find that it is quite common to see patients who haven’t been to the dentists in years as they had a bad experience in the past, which is quite often associated with the injection. Most people believe its because the needle is in the gums so it hurts. But actually, if the anaesthetic is administered too quickly it can cause pain. We administer the injection very slowly to ensure that it is comfortable and not painful for the patient. If you are scared of the dentist, it is a perfectly understandable and reasonable phobia to have. We will not judge or discriminate you in any way. We will work with you to help overcome your fear and identify what causes your nervousness. If you have had a bad experience in the past, we will create positive experiences for you to draw on for future treatments. If you would like to discuss your options or to meet with one of the dentists to discuss your phobias, please do not hesitate to call us today and book your free consultation.